Roaming Stamper: It's Not the Destination....it's the Journey!! Oh happy day!! 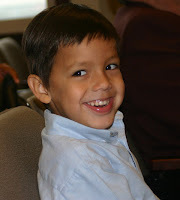 After 5 years and 7 months, our precious Miguel is now legally adopted. It has been quite the journey for him and his Mom and today it finally happened. Sarah became Miguel's foster Mom when Miguel was 11 weeks old and he's been with her ever since. Today he became part of her forever family. I'll never forget the day Miguel was placed with Sarah. After a visit to the doctor, she brought him to our house and we were immediately in love with this little boy. At 11 weeks he was barely bigger than our son at birth. But he had a smile that melted our hearts and a giggle that filled our house with laughter and love. On the left is him that first evening. Can you see why we loved him from day one? Here he is today, 5 years a nd 7 months later waiting for his adoption hearing to take place. As you can see the smile is still there! I can't even begin to explain all the emotions that were running through the courtroom as the adoption took place today but I can tell you that there were a lot of very happy people. Even the judge commented on the size of the group that turned out for this adoption. From family, close friends, co-workers, Miguel's teachers, and church members the judge's galley was filled. This was truly a special day for a very special little boy and it was obvious that he is one very loved child! 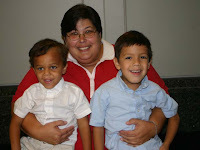 To the left is Sarah and her boys, now a forever family! As you can imagine, I have many, many photos of my "grandson" and so I've created a few collages to share with you today. The first one is Miguel through the years. I had such a great time looking through the thousands of photos I have of my little man. The next one is a collag e of Miguel's first trip to Walt Disney World. We were very excited to be able to take him this past May and spend an entire week exploring the world through the eyes of a 5 year old. The last one is a collage of photos that I took today a t the adoption. I especially love the one of Miguel watching Sarah sign the paperwork and the one of him hugging her face. Such precious moments in a very important day! Lastly, I'm going to share the card I made for Sarah, Miguel and Kevin that I gave them today. I think the card says it all. Sharon, this brought back wonderful memories of our own adoption. He is such a lucky little boy to have you all as his family. Yay for Miguel and his family!!! So exciting for everyone involved and congratulations to you and Ron as well. Brings back recent memories for us too. What a wonderful day for all of you Sharon!! I know you have been waiting on this for quite awhile, so I'm really happy it's a done deal for all of you. Enjoy the celebration this weekend, you deserve it! Hooray for you all!! Congratulations everyone!!! What a joy! HOORAY for Miguel and his family! What a lucky lucky young man! Such a wonderful day! A true blessing of family and love. Congrats to Miguel and his forever family. Beautiful pictures Sharon, thank you for sharing them with us! I'm so happy for Miguel! What an awesome day for all of you! Sharon, what a wonderful story and a wonderful day! Thank you for sharing with us! What a fun morning for everyone there. These are wonderful pictures Sharon! You really captured the JOY!! What a fun and special day for you all. You have built a memory for all involved that will be cherished forever! Wonderful news! Congrats to Miguel and his forever family of the heart! 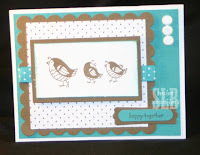 Great pics and card too! Thanks for sharing this wonderful news Sharon. Congratulations to the whole family! I loved looking at your photo collages and am so happy for you all.